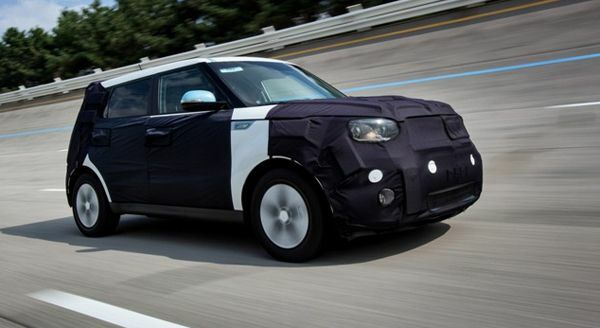 Kia has confirmed the development of an all-electric version of the Kia Soul, scheduled to go on sale in 2014. The ‘Kia Soul EV’ will be Kia’s first all-electric, zero-emissions vehicle marketed outside of Korea. The Soul EV should have stayed in Korea until the U.S. and other markets are more willing to embrace them. Apathy is continuing to kill the electric vehicle in this market (sadly) and not just GM. Kia says the Soul EV is coming to market not so much for fuel economy primarily but to make the company greener. “The new Soul EV will be at the forefront of Kia’s ‘Clean Mobility’ program, which aims to provide environmentally-friendly vehicles to our customers around the world, when it goes on sale globally next year,” said Kia Motors America’s executive director of product planning Orth Hedrick in a news release. “Although it is Kia’s first globally sold all-electric vehicle, the Soul EV is our second-generation battery electric vehicle and significantly benefits from the in-depth knowledge gained during development of the Ray EV sold in Korea,” said Hedrick. Equipped with a high-capacity 27 kWh lithium-ion polymer battery pack, it has a target range of more than 120 miles and Kia is calling the Soul EV a "uniquely designed battery electric vehicle … practical for everyday use and perfectly suited for city commuters." That's the immediate problem with the Soul EV and other electric vehicles on the market. It is coming to consumers before they are ready to face up to the perceived challenges of range anxiety. The uneducated buyer, who doesn't realize he or she usually drives only 40 to 60 miles a day, fears not being able to drive 300 miles on one tank of fuel. It's irrational but it's a fear slowing down the development of more electric vehicles. The front-wheel drive Soul EV prototype test cars currently under development are built on modified versions of the 2014 Kia Soul and are powered by a 109-hp electric motor, producing 210 lb.-ft. of torque. You're not going to hit any top speeds with the Kia Soul EV, nor are you going to get anywhere quickly. It has a projected top sped of 90 mph and takes a relatively glacial 12 seconds to break the 60 mph barrier from a dead stop. For the benefit of pedestrian safety, the Soul EV will be equipped with a Virtual Engine Sound System that emits an audio alert at speeds below 12 mph and whenever the car is in reverse. Walk in front of one going faster than 12 mph and it's survival of the fittest. Inside the cabin, the vehicle is fitted with a unique Supervision instrument cluster and center stack with an eight-inch display screen. In keeping with its eco-friendly ethos, Kia is promoting that the interior components and trim will use an increased range of recycled materials including Bio Plastic, Bio Foam, Bio Fabric and Bio PET Felt, together with low volatility organic compounds and newly developed antibacterial materials and paint. The little-known secret is most vehicles already have at least 85% recycled materials in them. But, it makes companies feel good to promote how green they truly are. Well done on article. We need more EV for ckeaner local air. People really need to get over the range anxiety. Bring an exension cord. Need to team up with auto places fOr easy access quick charge up a little infrastructure. Walgreens has them all over ... Plug share.com . Cannot wait to get my EV. This will be a CAFE compliance car and not much more. At least to start. Ontario, Canada, has no 'CARB', but they are coming here, too! So, maybe a bit mire than 'just' a compliance car! I expect them to be sold in Quebec, and B.C., Canada, as well! With all respect to Kia I see they were very careful not to mention the cost to the public at this time. Despite the range increase, cost is still the barrier to full acceptance, in my opinion; and will remain. In my view, it is getting harder to justify full EVs over I.C.E. vehicles which are getting more and more efficient, and autogas is getting more attention. Just wait until HCCI and split-cycle engines with air hybrid hit the market in a few years. Read "Splitting I.C.E."